We’re excited to announce that we’ve partnered up with America’s Test Kitchen and several other companies to give four lucky winners the chance to win some great baking essentials! With Fall officially here, Baking Season has begun and we want you to be ready to whip up some delicious recipes in the kitchen. The Grand Prize winner of the $5,000 Baking Essentials Sweepstakes will win a KitchenAid Pro Line 7-Quart Stand Mixer and over $2,500 in bakeware, kitchen tools, gourmet baking ingredients from Rodelle, cookbooks and online baking courses — plus $1,000 cash to spend as you wish! Three $250+ Runners Up will receive bakeware, kitchen tools, gourmet baking ingredients from Rodelle, and cookbooks ! We’re getting extra generous with our vanilla and cocoa products to give all of the winners a delicious assortment of primary baking flavors from Rodelle. You might already be familiar with some of the other partners in the giveaway: Nordic Ware, Sally’s Baking Addiction, Organic Valley, and Chef Central. We think everyone involved in the Sweepstakes is the perfect fit for fall & winter baking. Nordic Ware just launched the CUTEST apple pan, and you need to check it out! If you’re dreaming up what you would make with all of the gourmet baking essentials from Rodelle, check out our recipe gallery with ideas for every occasion! And, if you’re looking for more information on our products, you’ll find it here! 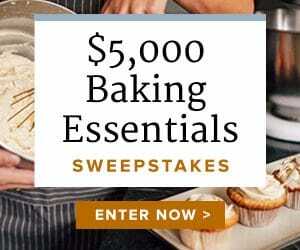 Enter the $5,000 Baking Essentials Sweepstakes today and be sure to refer your friends for extra entries!